I thought is was straightforward to install. It worked first time for me without any problems whatsoever. I'm also happy with the number of options I have to set up the program. For example, I can schedule when the programs scans my computer for any nasties. I usually set mine to run every Monday at 14:00. 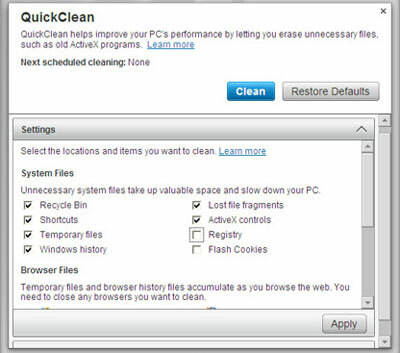 I also like the Quick Clean options given to improve my computers performance. I can instruct it to get rid of things like Active X Controls and deleted e-mails from Outlook Express. I've also found my computers performance is not affected by the Anti Virus program. I'm pleased about that. I'm also happy with the fact that it seems to handle any virus problems well. It has picked up a couple of things which could have turned nasty had they got onto my machine. I really don't have anything bad to say about this program. I would recommend the McAfee Anti Virus program to my friends and family. Before I bought McAfee's product I have used several free anti virus programs. For example, AVG and Avira. Both are very good programs but I prefer McAfee's solution because of the additional options it has. I would consider using a free Anti virus program again. These days they are much more sophisticated and they do get regular pattern file updates which makes them less risky than before. Hello Brendan. Thanks you for your web page. I'm pleased to hear the McAfee Anti Virus program is working well for you. I read a lot of negativity about McAfee's products. It is refreshing to hear something positive for a change. I'm happy to hear you are making full use of the all the additional options that come with McAfee's program. Quite often these are overlooked and sit unused for the duration of the programs life. I also agree with your assertion about free anti virus programs. There are some excellent programs available that are free of charge, and will protect your computer just as well as some of the commercial products available today. Thanks again for taking the time to submit your contribution. Join in and write your own page! It's easy to do. How? Simply click here to return to McAfee Free Virus Scan.